Chidren grow so quickly but sometimes their teeth don’t. Or maybe their teeth are crooked, missing, or widely spaced. No doubt you have lots of questions. Should they undergo orthodontics treatment? When should they start wearing braces? If your child is under the age of 3 or 4, and his/her teeth may have gaps between them. Since these are just baby teeth, the gaps will likely change or even disappear when the new, permanent teeth start to erupt at around 6-7 years of age. Even though Dr. Doan loves treating children, there are some children who may not need braces since their teeth are already aligned! If the teeth do not appear straight, the recommended age to see Dr. Hanh Doan is 7 years of age or earlier if there are signs of teeth crowding or jaw problems. As was mentioned earlier, the first set of permanent teeth usually erupt around this time. This allows for more accurate orthodontics assessment and planning. Phase I early treatment helps to direct the developing permanent teeth (usually the front 4 teeth and first molar) into better position as the jaw and face mature. Phase I treatment helps to achieve the optimal functional position of the teeth and jaw while they’re still growing and serves as a foundation for Phase II treatment to produce a more lasting, functional result that looks and feels great. 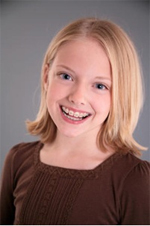 Phase II treatment is “full” braces treatment to positions all of the permanent teeth into their proper position to maximize form and function. Phase II treatment can be initiated between the ages of 10-12 years of age when all or most of the permanent teeth have formed. After Phase II treatment, retainers are worn to maintain the position of the teeth and allow them to “set in”.